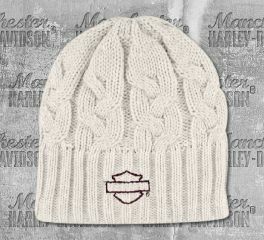 Harley-Davidson® women's knit and fleece hats. View our selection and gear up for the cold weather. 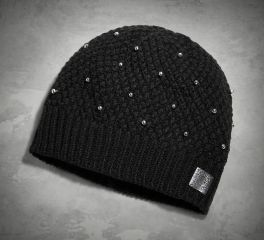 Harley-Davidson® Women's Black Embellished Knit Hat is insanely soft, perfect for cold weather and still will keep you looking cool. Harley-Davidson® Women's Embroidered Blank Bar & Shield® Knit Hat features a simple, but adorable embroidered blank Bar & Shield® logo on front. Made of super soft 100% acrylic knit with a 97% polyester and 3% spandex liner. High-quality knit cap with a super soft fleece liner. Stay extra warm this winter with this adorable beanie.